The kids are back at school, Fall is in the air and it is time for football. However, this season, there are big changes on and off the grid iron — the iPad has been drafted by 14 pro football teams, which have made the switch from ink on dead trees to Apple’s world-beating tablet. Yup, the iPad is bumping paper from its NFL playbook starting role. There are 32 NFL teams and 14 of them — Bears, Cardinals, Cowboys, Lions, Packers, Panthers, Redskins, Seahawks, Bengals, Broncos, Chargers, Colts, Dolphins and Ravens — are replacing paper NFL playbooks and scouting packages with the iPad. They’re using Apple’s top-of-the-line 4G LTE with 64GB model ($829) loaded with $700 of custom apps, a package that costs more than $180,000 per team to rollout. In addition to saving a lot trees — each massive, 60 pound three-ring binder NFL playbook includes more than 300 pages — NFL teams are also saving players’ backs. Additionally, there are other benefits, like the fact that play diagrams can be animated, scouting videos loaded right on the device and everything can be updated over-the-air. One team that hasn’t gone all in with the iPad is New Orleans. But Saints players are using the Apple tablet for video and that has given them as taste for what could be. And, it’s not just players that see the advantages. 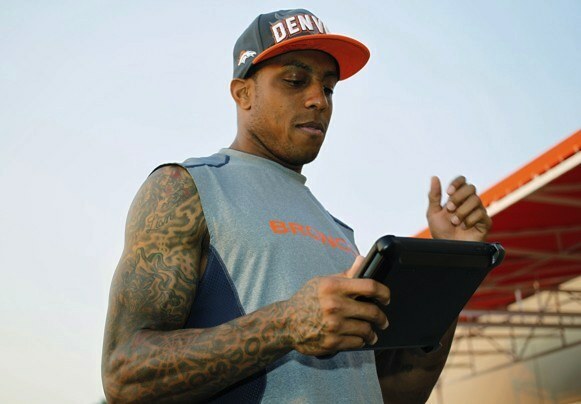 Denver Broncos video director Steve Boxer is now able to wirelessly push game video to coaches’ iPads, which kept them at home on a recent Sunday morning rather than rushing to the office to review game footage.